Jefferson Nickels began production in 1938 to replace the Buffalo Nickel. The Jefferson Nickel is still being produced today, although with a different obverse. We are buying circulated nickels dated 1959 and before, and BU rolls prior to 2004. Below is a picture of a 1939 Jefferson Nickel. Nickels carried this design through 2004. The only exception was 1942 through 1945 where nickels has a change to the composition. To mark this, the Mint used a large mint mark on the reverse. 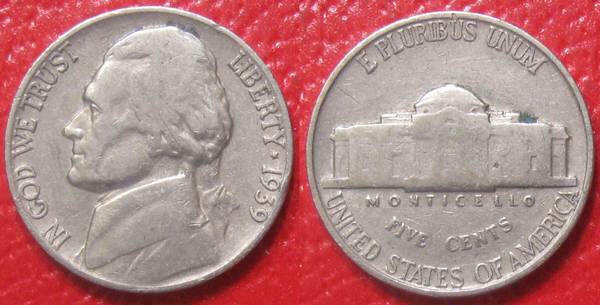 The composition change added silver to the nickel to save other metals for the war effort. 1942 nickels were made of both compositions. The nickels with the large Mint Mark on the reverse are commonly known as war nickels. The picture below depicts the three portraits of Jefferson that have appeared on the nickel.